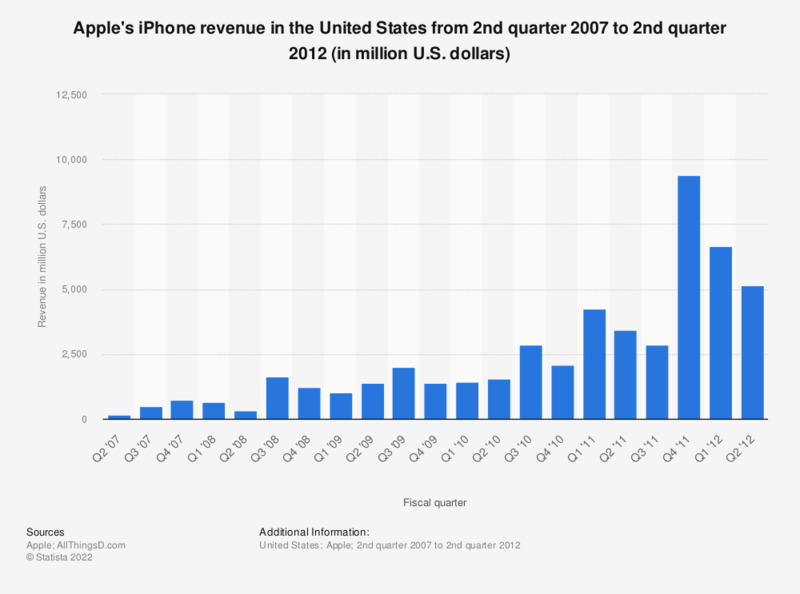 The statistic shows the revenue of the Apple iPhone in the United States from the second quarter of 2007 to second quarter of 2012. In the first quarter of 2008, Apple generated 671 million U.S. dollars selling iPhones in the United States. In the first quarter of 2007, Apple generated 5 million U.S. dollars selling iPhones and iPhone related goods and services worldwide. In the 2011 fiscal year, Apple sold 72 million iPhones. In less than 5 years the iPhone has become Apple’s most important product: in the 2011 fiscal year, iPhone revenue amounted to 47 billion U.S. dollars, representing more than 40 percent of Apple's total revenue. In the third quarter of 2011, 15 percent of all smartphones sold to end users were phones with the iOS operating system. In May 2011, Apple's market share in the U.S. smartphone market was 26.6 percent. Data is displayed in calendar quarters. Apple operates on a fiscal year ending September 31. Apple iPhone revenue = "Total Handset Billings"
Apple iPhone units include iPhone 3G, iPhone 3GS, and iPhone 4.